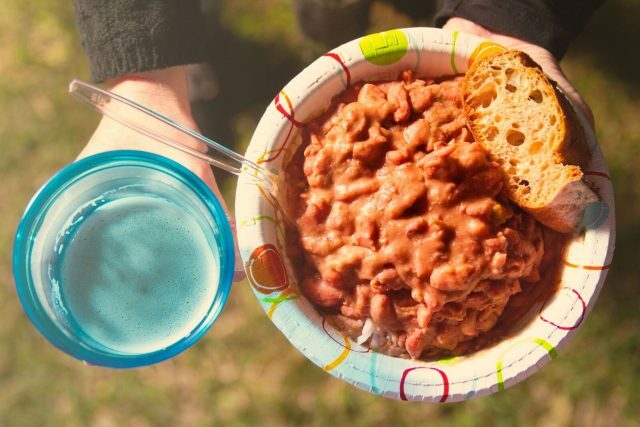 Serving up red beans and rice is a beloved Monday tradition, but it’s also a great way to feed a crowd at an outdoor Mardi Gras party. 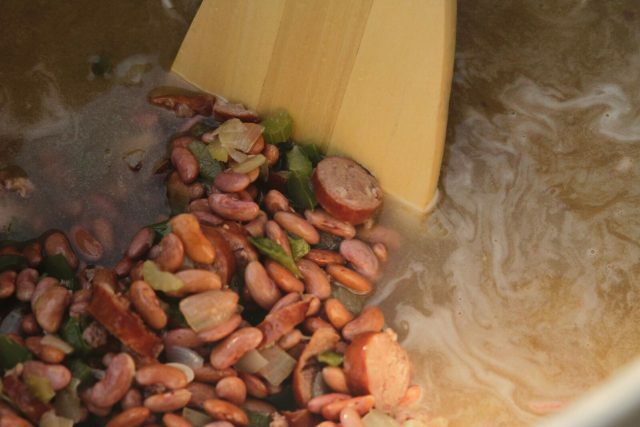 Whether you live on or near a parade route — or just love to celebrate Carnival wherever you are — big pot cooking in your backyard is the best way to whip up a large batch of red beans & rice that’ll feed a ton of hungry people. 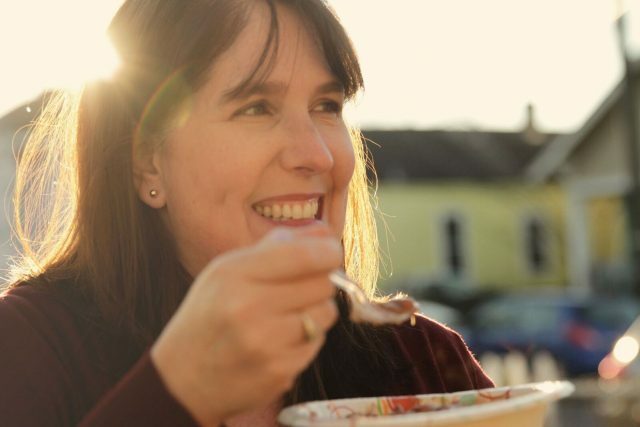 Believe it or not, you use the same ingredients you regularly use, just in larger quantities and in a bigger cooking vessel. 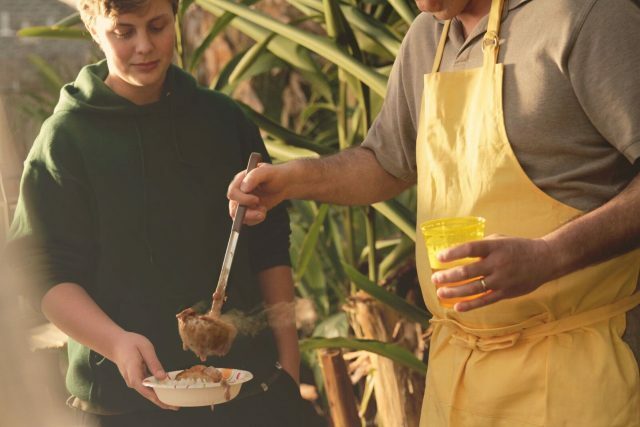 You’ll need a 50-qt. 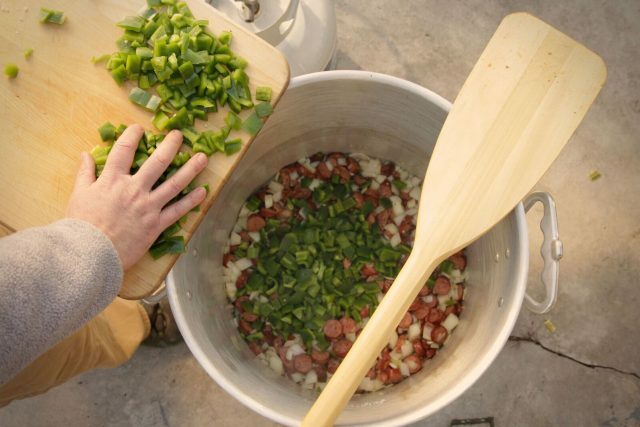 (or larger) seafood boil pot, a burner, propane and a wooden paddle. Plus a few hours to add the ingredients, bring it all to a boil, and simmer till tender. With a keg nearby and the sound of marching bands in the distance, it’s a great way to spend an afternoon during Mardi Gras season. 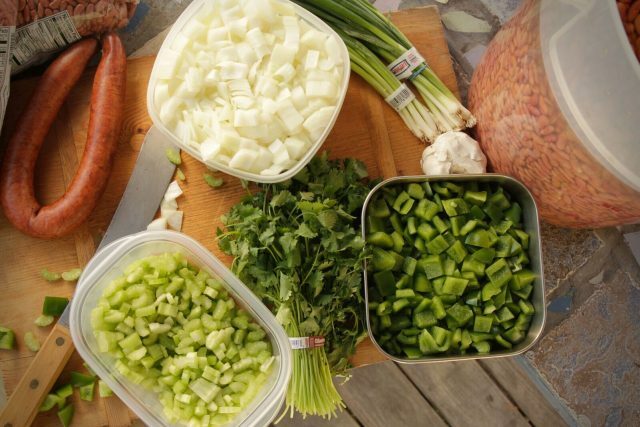 The key to successful outdoor cooking is all in the preparation. 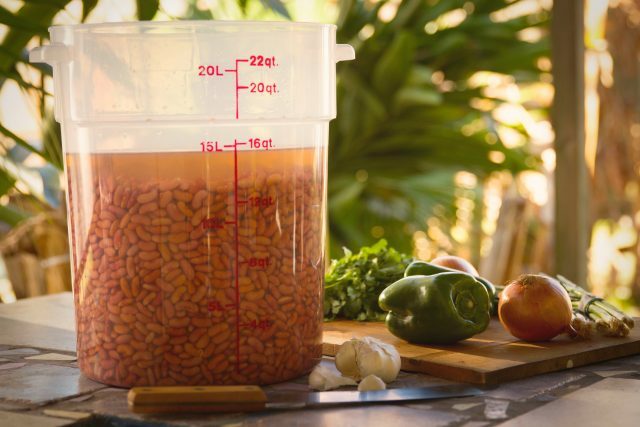 Soaking 8 pounds of red beans is no small thing, so find the biggest food-safe containers you have, or invest in a large plastic bucket (easily found at restaurant supply or home improvement stores) that the entire batch can fit in. 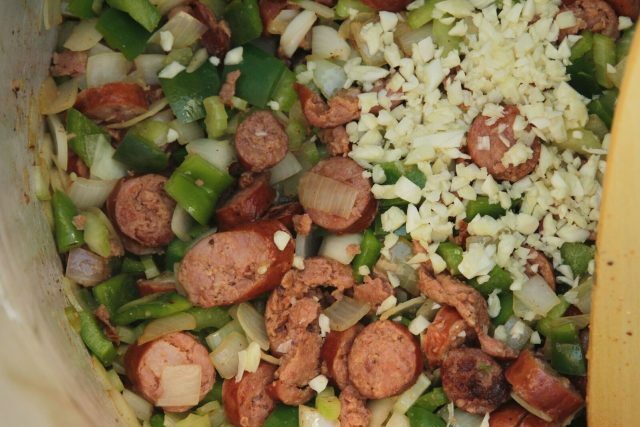 The night before, in addition to soaking the red beans, dice the vegetables, mince the garlic and slice the Andouille sausage. 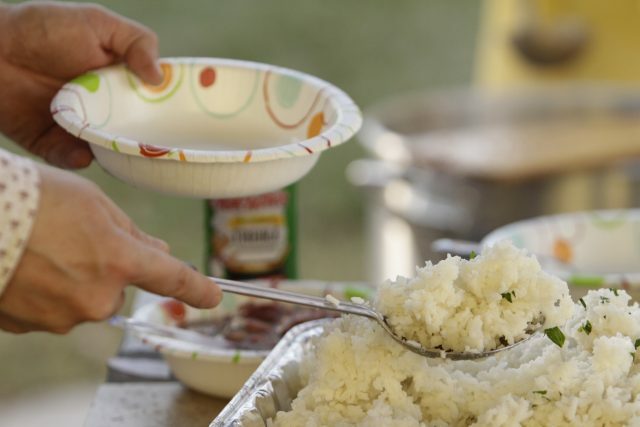 To make the cooking process easier, store everything in containers so they’re ready to go. You’ll also want to render the bacon fat the night before, by cooking a 1/2 pound of bacon in a skillet. (Cooking bacon slowly over low heat will provide you with a higher yield of bacon fat.) Remove bacon from skillet, carefully pour the bacon grease into a non-plastic jar, and store in the fridge. It will solidify overnight, making it easy to scoop out the next day and add to the pot. First, the sausage is browned in bacon fat, and then the vegetables get added. 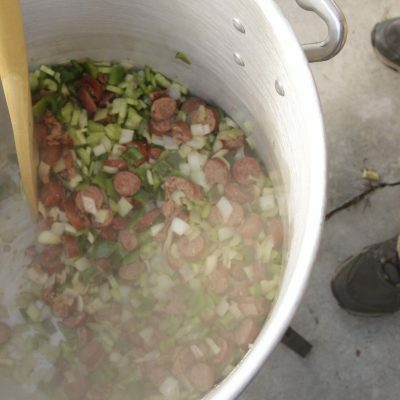 Two gallons of water and soaked red beans are added to the pot, along with seasonings. 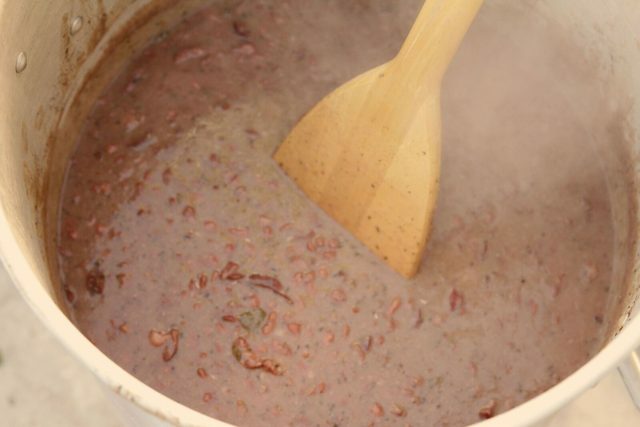 Once the beans come to a boil, reduce heat, cover and simmer on low for 2 hours or until the red beans are tender, stirring occasionally. Smash some against the side of the pot for added creaminess. 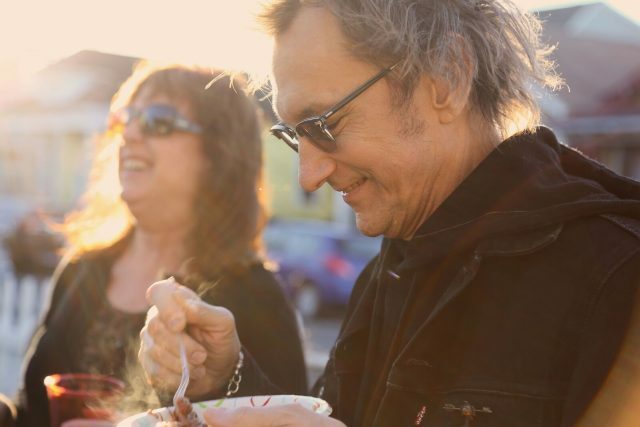 Hanging out with friends and family on a parade-filled afternoon is a quintessential New Orleans experience. 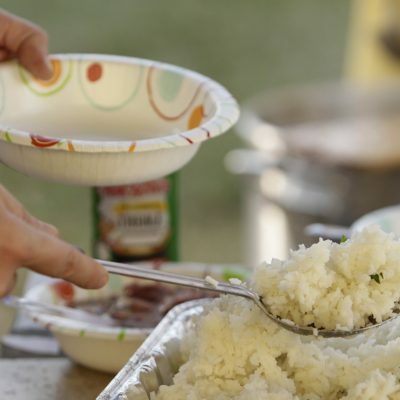 And by adding a big pot of creamy red beans and hot cooked rice to the celebration, you’ll keep ’em coming back for more. 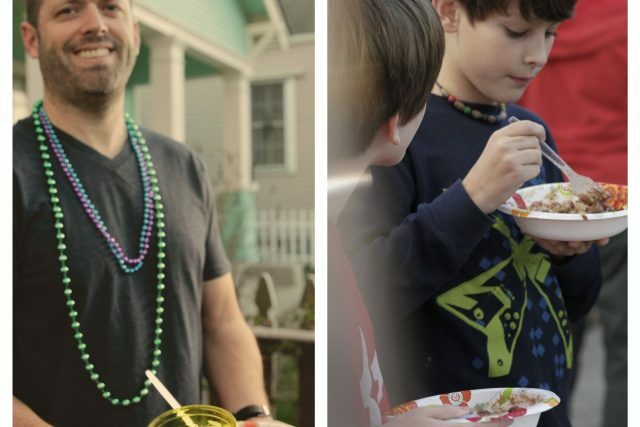 It’s exactly the kind of popular, hearty dish that keeps a Mardi Gras party going, providing sustenance for a hard day’s work of catching beads and drinking beer. 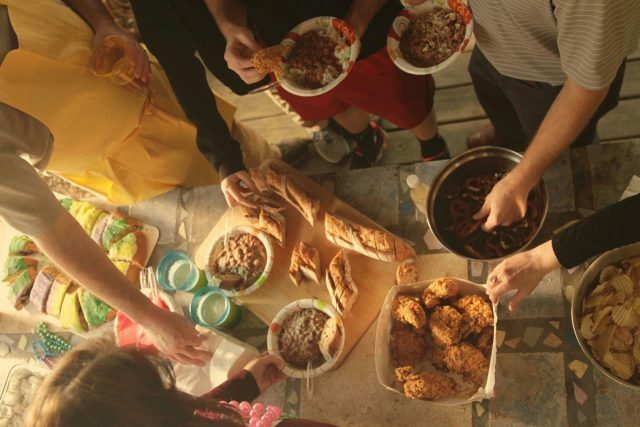 Be sure to round out your party spread with bowls of chips, a couple of boxes of your favorite store-bought fried chicken, and a big, ooey gooey king cake. 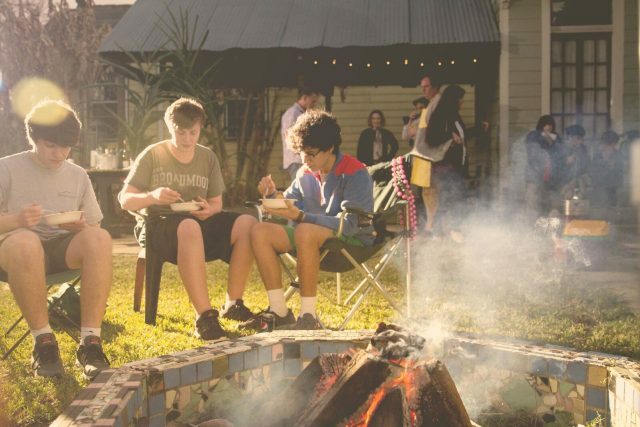 Now, that’s a Mardi Gras party! PRO TIP: When cooking in a big pot over a centered, narrow heating element, you need a utensil with a flat head (like a wooden paddle) that lets you scrape the bottom of the pot as you cook, so that it doesn’t burn. If the sausage and vegetables start to stick while cooking, add more bacon fat or a few glugs of olive oil. 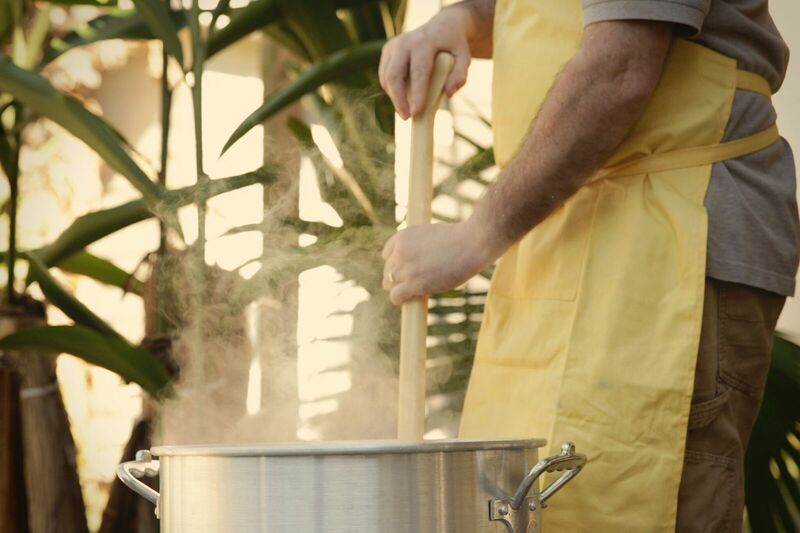 PRO TIP: If there’s too much liquid in the pot, raise the heat back up to a rolling boil to burn off some of the liquid. 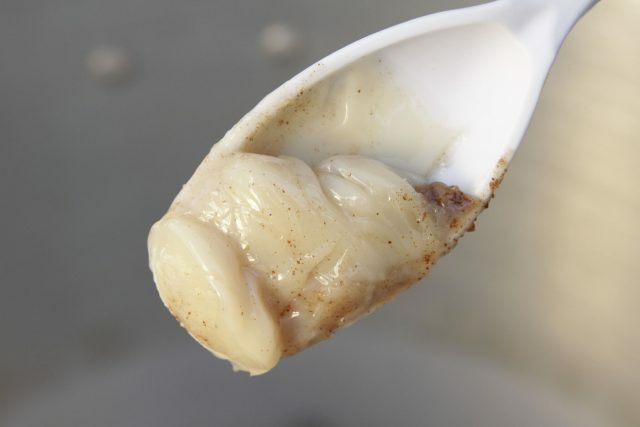 After letting the pot boil for 10-15 minutes, reduce heat, and let simmer for 20 minutes. 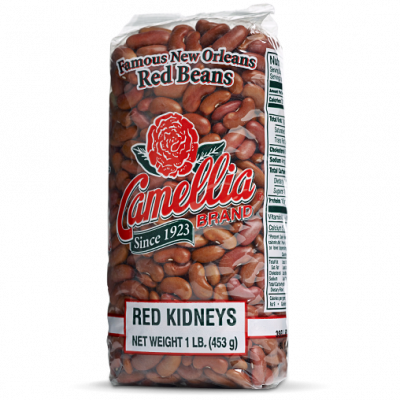 PRO TIP: To make it a memorable Mardi Gras experience, add a bottle of beer to the pot when you add the red beans. 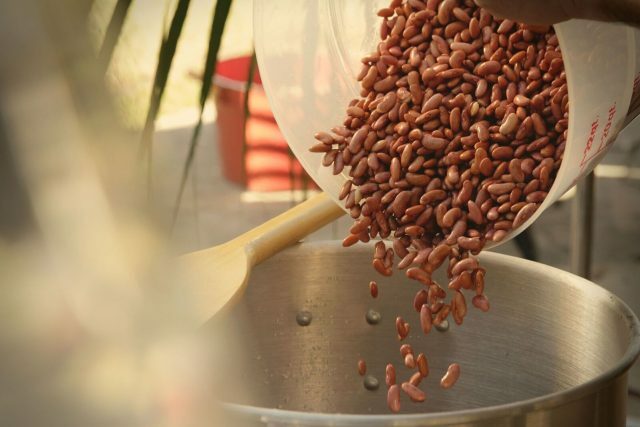 The yeast in the beer will help thicken the pot and give the beans a unique flavor.